Students examine case studies, become familiar with technology, gain insight into marketing success stories, learn more about specific careers in the field, and get practice working through real-world activities! Power Read. Feature box at the beginning of each chapter that lists 4 reading strategies to help students get the most out of the text. These reading strategies are then implemented throughout each chapter with questions at point of use to cue students. Real-World Scenario begins each chapter, with Part 2 continued in the middle of the chapter; each part concludes with 2 critical thinking questions. World Market. International marketing feature emphasizes the global nature of marketing related to the specific marketing area; concludes with a critical thinking question. Hot Property. Profile of a successful and/or creative business (large or small); concludes with 2 critical thinking questions. Profiles in Marketing profiles a successful or noteworthy individual working in a marketing-related career. A sidebar Career Data box outlines education/skills/career outlook/career path. A critical thinking question follows. The Electronic Channel focuses on how sports and entertainment marketing utilizes the Internet and Web site resources, and concludes with exercise directing students to the Web site. Game Point. 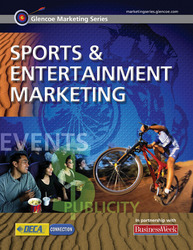 Brief interesting facts on sports and entertainment marketing. Ethical Practices focuses on current legal, ethical, community service, and character education issues and practices applied to the specific marketing area. Tech Notes focus on use of the wide range of technology applied to the marketing area, and concludes with an exercise directing students to the Web site. Math Check. Brief math exercise tied to specific text at point of use. DECA Prep. Role-play activity to prepare students for DECA events. BusinessWeek News. Unit-related BusinessWeek article excerpt with Creative Journal writing activity. The Virtuality Store. Unit Lab assignment that provides real-world activity. Chapter 3	What Is the Sports Entertainment Market? Chapter 10	What Is the Entertainment Market?